With revenue tumbling and a buyout off the table for now, the company's job cuts did little to reassure investors. What: Shares of Synaptics (NASDAQ:SYNA), a provider of human interface technology for PCs and mobile devices, tumbled 20.8% in June, according to data provided by S&P Global Market Intelligence. News that buyout talks had ended without a deal, along with the company's disclosure of major job cuts, sent the stock lower. So what: According to Bloomberg, Synaptics was close to a deal with a state-backed Chinese investment group back in January that would have seen the company acquired for more than $110 per share. On June 7, Bloomberg reported that it was no longer in active discussions with the Chinese suitors, although the talks could reportedly be restarted at a later time. This news came after Synaptics stock tumbled in April due to weak results and guidance. On June 16, Synaptics filed a form with the Securities and Exchange Commission stating that the company had eliminated 160 positions, reducing its global head count by roughly 9%. Synaptics described the move as a cost-cutting measure meant to align its cost structure with revenue levels. 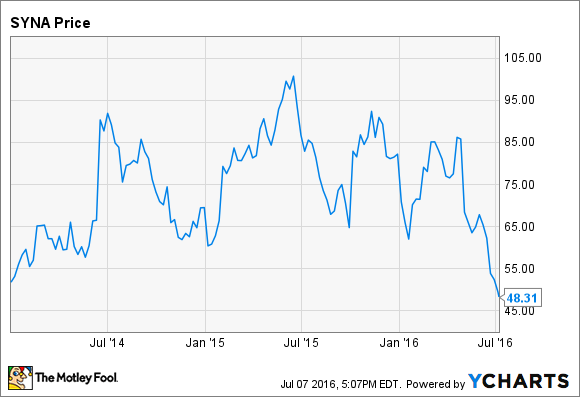 The June decline in the stock continued a trend that began earlier this year. Since the beginning of April, it has lost 45% of its value, and since peaking in mid-2015, it has dropped about 52%. Now what: Synaptics' results have been hit hard by both the ongoing slump in PC sales and the recent decline in iPhone sales. Revenue fell by 16% year over year during the company's third quarter, and non-GAAP EPS dropped by 28%. While Synaptics described its issues as "a short-term pause in our top-line growth," layoffs suggest that it doesn't expect revenue to recover anytime soon. With the smartphone market growing slowly this year, all companies that are dependent on mobile devices are feeling pressure. Synaptics' job cuts should help bring costs down and improve profitability going forward, but investors are only seeing the negatives.